Millennial pink is a blush tone of pink that everyone is obsessed with. No one can seem to leave it alone. The color makes you feel happy and alive, so why wouldn’t you want to include it in your holiday decor? The trick is doing it the right way. Try one (or all) of these five options and create a millennial pink Christmas you’ll never forget. Most people can’t afford to buy a completely new set of holiday decorations each year. If you are one of those many, don’t worry. You can still incorporate millennial pink into your decorations by focusing on the small things. Buy a few, stand out pieces and place them in areas of your home that get the most attention. For example, you could use a gorgeous nutcracker as the centerpiece for your dining table. Or, highlight your mantle with a millennial pink sequined stocking. The possibilities are endless! If you want to add a little more pink to your holiday decor, try swapping out some traditional favorites for some non-traditional goodness. One of the easiest ways to do this is to replace your green garland with pink. Add some white lights and your home will be aglow with blushy tones. You could also opt for a pink wreath instead of a traditional red and green one. It will let visitors know that your home is staying on trend this holiday season. If you’re on a budget, why not purchase items you can use all year round. Rather than buying pink holiday decorations, simply pick up some pink home essentials. A few pillows and a blanket can go a long way. If you want to add even more comfort to your home, consider some gorgeous pink candles. They will add warmth and style to any room. If you’re going for a more unconventional look, consider investing in some pink serving and dishware. Pair with white or gray pieces to create a modern dining set all your friends will be jealous of. Chances are that you need to purchase new gift wrap this year anyway. So, why not pick up some millennial pink options to make your presents pop? Look for something with gold or silver accents. These papers will give your gifts that high-class look everyone desires. You can also get creative and DIY your own pink creations. Buy some basic pink paper and accent with ribbons, tulle, bows, lace, or anything else you have lying around. You really can’t go wrong. What better to showcase your love for millennial pink than the centerpiece of Christmas? 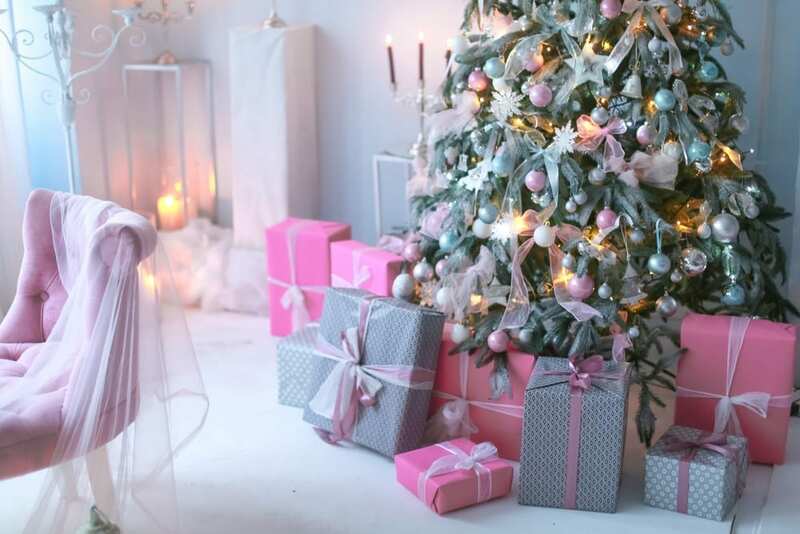 Adorn your Christmas tree with all shades of pink for a look that will leave your guests blushing. If you want a softer, vintage feel, add white accents. If you’re going for more of a pop essence, gold will do the trick. You could also opt for an entire tree that is pink. Then, adorn with white or gold ornaments. Your tree will be the envy of the whole block.